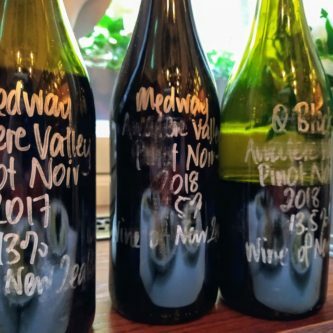 Chief winemaker at Yealands, Natalie Christensen, was in London last week to show off the Awatere estate’s new releases, having just caught up with her extended family in Denmark. Yealands has made a name for itself as a maker of a grown-up style of Marlborough Sauvignon Blanc – and it still does that. But the focus here was broader, showing their full range of whites including Pinot Gris, Grüner Veltliner, Gewürztraminer and Riesling, as well as a handful of Pinot Noirs. And why “to boldly go”? Yealands’ marketing strapline is “Think boldly. Tread lightly”, referencing their pioneering attitude with green credentials. Exposure to wind in the Awatere makes for smaller berries with thicker skins and results in intense flavours in the wines. There is life beyond Sauvignon Blanc – Yealands Estate Riesling really impressed with its gradually flowering aromas of orange blossom and lime and herbal palate. The Pinot Gris struck a fine balance between the simple, crisp pleasures of Italian Pinot Grigio and the richer, more aromatic Alsace incarnation. Having said that….Sauvignon Blanc is still 85% of Yealands’ production – and they do it well, with a range of bottlings showing different nuances (not a word that you might readily associate with this grape in New Zealand). Not a gooseberry in sight (or smell). Get blending – I enjoyed the Grüner and Gewürz, but was most impressed with the perhaps underwhelmingly named PGR (as in an annually changing blend of Pinot Gris, Gewurz and Riesling). The Pinot Gris acts as what Natalie called “the cuddly arms bringing it all together”, alongside the more assertive varieties. It’s not all about the whites: Marlborough Pinot Noir is making great strides – there was lovely balance of cherry fruit with delicate use of oak in the wines from the cooler vintage of 2017 – and even a hint of natural winemaking in the low intervention Q Block Pinot Noir 2018 barrel sample. Natalie, who succeeded another gifted female winemaker Tamra Kelly-Washington, has been at Yealands for three years now and seems to have settled into the groove, producing well-made wines which say something about their origin – the opposite of “look at me” wines which could have been made anywhere.